How to unseal the real essence of data? Well, you can consider this data as a raw chunk of information which is lying at the very base level in any system. This core material has to be then treated to devise meaningful research about facts and figures. This is where Data Science comes into play. It is nothing but a collaborative mix of data interference, algorithm development, and technology, which helps to solve the most complex issues analytically. 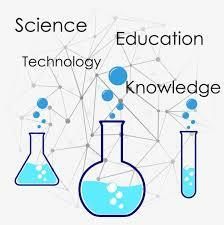 This process involves a certain level of filtering, starting from core data to a finished, well-researched information. In the middle, lies storing the raw statistics and performing data mining using the most advanced capabilities. Data science guides you the right way in which you can use the data creatively and generates some additional value to your business. 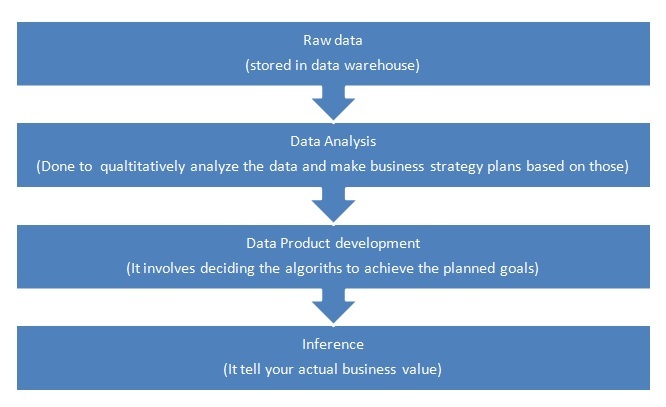 This diagram explains the entire workflow of how data science works on raw data and processes it to get the desired output. In this, the hidden information about the system is taken out so that companies can decide better execution plans. Working on minute details and understanding how the present behaviour is based on the present trends, is the prime focus. You must be wondering how data scientists do this mining job. Well, they start with exploring the raw data like detectives. 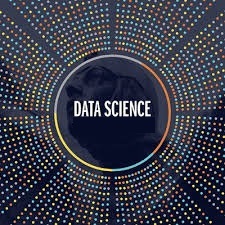 With their proper data science training, knowledge and analytical creativity, they find out the exact leads to see the pattern and characteristics within the existing data. Accordingly, data scientists apply quantitative techniques to move into a deeper level of understanding. These techniques include several types of models and analysis systems like inferential models, time-series forecasting, segmentation analysis, experiments for synthetic control, etc. With the use of the most scientific approaches, these data scientists present a forensic view of the raw data. A Data product is nothing but an asset which consumes data as input and with the algorithm based processes, it generates output. A self-driven car is an example of data product which involves machine learning algorithms so as to recognize traffic signal lights, other cars on the road, pedestrians, or any other obstructions. Here, the main focus is on technical functionality encasing the algorithms instead of just advising a smarter business decision as in step 1. This step is designed to integrate and execute the plan into the key applications. Like in the above example, the autonomous driving software uses data product in the background to function in the best way. These experts of data science course are helping out several companies as advisors to modify their strategic plans in order to increase the success rates. 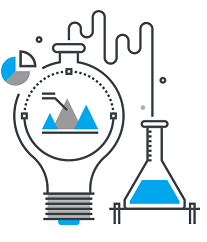 Thus, the data scientists play a very important role in designing and developing an algorithm based product and with various levels of testing, improvements and infrastructure, they devise the best and the most efficient outputs. Data Scientists act as the technical developers who are responsible to develop assets that widen the overall sphere of working capacity. To become experts of this field, there are many reputed institutes in India who provide training of these courses and especially if you are in southern part of India, then Data Science training in Hyderabad is one of the best options. Approaching them is a wise decision in order to achieve the desired goals. How is data science important for today?